The Mighty KBC is testing on 9400 kHz on Sunday, October 7th, 2012 between 00.00 – 02.00 UTC with 100kW beamed to the USA, South America and Canada. This entry was posted in Broadcasters, News, Shortwave Radio and tagged KBC, KBC Radio, Shortwave Radio, The Mighty KBC, The Mighty KBC Test Transmission on September 28, 2012 by Thomas. 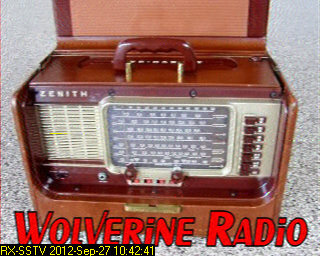 Wolverine Radio sent this SSTV image at the end of the broadcast. This one was decoded with the PC freeware, RX-SSTV. Wolverine Radio was broadcasting on 6.95 MHz in the upper side band. Their signal was very good and fidelity excellent for SSB. Lots of variety and a common “radio” theme throughout WR’s music mix. Wolverine Radio–at least each time I’ve heard them–sends an SSTV image at the end of the broadcast. I decoded the one in their Satuday night broadcast (see image on right) using RX-SSTV, a very intuitive and simple freeware PC application. Make sure you use the “Scottie 1” mode. This entry was posted in Pirate Radio, Recordings, Shortwave Radio and tagged Pirate Radio, Shortwave Radio Pirates, SSTV, Wolverine Radio on September 27, 2012 by Thomas. I just received the notification below from Microtelecom. I find it very encouraging that they are still tweaking and working on the Perseus software (which is quite mature at this point). No major upgrades here, but they’re worthy updates. A new Perseus release is now in the BETA phase. There are quite a few changes in both client and server. -The servers map is no longer integrated in the Perseus software (when clicking on the “Show Map” button, a default browser window will open). The link between the map and the Perseus software is done by a tool (included in the package) called mttps.exe. During the first run, administrative privileges are required to properly register the MTTP protocol. -Buttons font rendering was modified to address some users that reported “blocky” or hardly readable labels on some buttons. -Audio Delay: this new feature inserts a configurable delay in the DSP chain, please refer to the release notes (included in the package) for more information about it. -Blacklist support: using a text file (as explained in the release notes) it is possible to reject connections from an IP address or family of IP addresses (server software settings has a new section). This entry was posted in News, Shortwave Radio, Software Defined Radio and tagged Microtelecom, Microtelecom Perseus, Microtelecom Perseus Updates, Perseus, Perseus News on September 26, 2012 by Thomas. Radio Appalachia is the only pirate I’ve ever heard on the shortwaves which features bluegrass and gospel music. This recording was made Saturday night on 6.9349 MHz (AM). This entry was posted in Music, Pirate Radio, Recordings and tagged Pirate Radio, Pirate Radio Recordings, Radio Appalachia, Shortwave Pirate Radio on September 26, 2012 by Thomas. Radio Australia will broadcast coverage of the AFL Grand Final on Saturday 29 September 2012 from 0430-0745 UT. It will be part of our regular Grandstand sports coverage. The coverage will be available on our HF (shortwave) and local FM relays, but it will not be available on RAs web stream due to content rights limitations. Our HF coverage will be as follows. Reception may also be possible on 4835 kHz from the ABC domestic HF service at Alice Springs. 4835 kHz would be a good choice for land-mobile operators within 1,500 km of Alice Springs. Reception of 4835 kHz may be possible beyond 1,500 km. Note: Reception of particular HF channels may be possible beyond the nominal target areas. Please try all frequencies to ascertain if reception is possible in your area. This entry was posted in Broadcasters, News and tagged AFL Grand Final Shortwave, AFL Grand Final Shortwave Frequencies, Radio Australia on September 25, 2012 by Thomas.